Ever been there? I have – too often. It’s a vicious cycle you get caught in when trying to decide on a restaurant no matter who you’re with, or where you are. Your ‘food mood’ can change daily. Or hourly. So there’s this great spot, right here on Ocean Street, that appeals to many food moods. 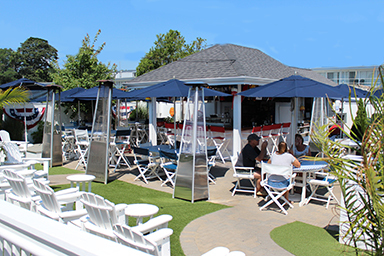 The Black Cat has three restaurants in one location, across from Hyannis Harbor. Even if you get there and still don’t know what you want, you will soon figure it out. The Black Cat is coined as casual waterfront dining, but honestly, I think of it as a little more upscale. The dark wood and nautical decor is very welcoming, in a warm sort of way (does that even make sense?). Serving the best Cape Cod has to offer: raw bar, steamers, mussels, crab cakes, quahogs, scallops and bacon, tacos, quesadillas, salads, fried seafood, sandwiches, burgers, steaks and fresh seafood such as cod, salmon, tuna, scallops, lobster…just a few of my faves! They also have live entertainment in their bar every nights. The Black Cat is also a favorite among islanders who have some time to kill before getting on the boat back home! Check out The Black Cat Harbor Shack, just right for grab and go or if you need to make a pit stop before or after the beach or boat! Order at the window and sit on the deck in the shade, watching all the activity on Ocean Street. The Harbor Shack is PERFECT for families! In addition to their extensive lunch and dinner menu, they have A LOT OF ICE CREAM to choose from (I’m always in the mood for ice cream). And now, for my favorite, favorite part: the Shack Out Back. Yes, you’re on Ocean Street, but you’re not – you’re out back. It’s like you’re in a new little world, surrounded by beautiful, lush shrubs, on vibrantly green grass. There is a raw bar, high-top tables and separate high-back chairs for lounging. 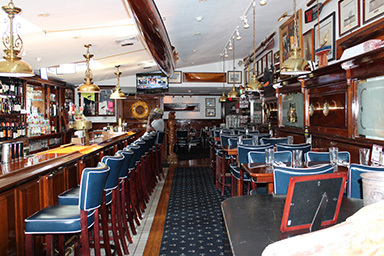 Their extensive menu and specialty drinks make it the perfect hangout on Ocean Street. And they have live music on Friday, Saturday and Sunday afternoons! That’s right – AFTERNOON – not late like 10 o’clock, because I can’t hang like that anymore. Want an amazing lunch or dinner in Hyannis at The Black Cat? Enter to win our social media contest and select the Hyannis Getaway, which includes a $75 gift certificate!